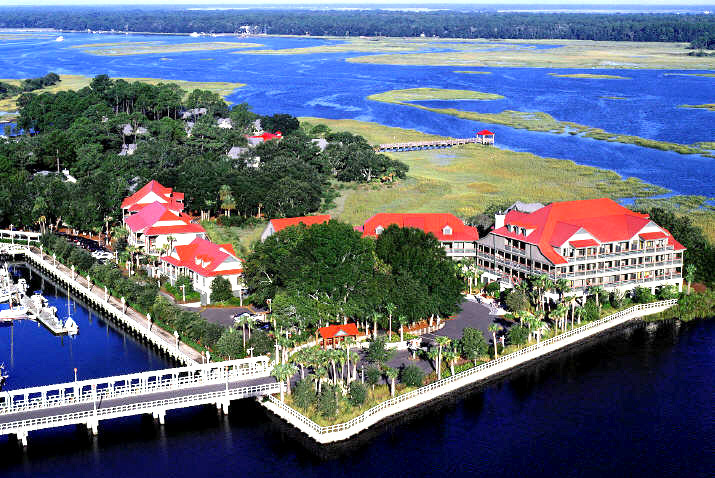 Disney’s Hilton Head Island Resort combines typical Disney hospitality, charm, and character with the beautiful surroundings of one of the southeast’s premier island destinations. The magic of Disney is alive on the shores of South Carolina! Located on a 12 mile stretch of white sandy Atlantic beach and nestled among live oaks, pines, and palmettos, you can enjoy this amazing venue in so many ways. With the feeling more like a beach village full of activities for the entire family, this resort brings summer camp fun Disney-style to reality. Though not near the Disney theme parks, Disney magic can be found all around if you just take the time to look. Convenient to some of the most beautiful east coast golf properties in the country, this resort offers the diehard golfer all the challenges he could desire. As one of the Top 10 golf vacation destinations in the country, there are more than 20 courses on the island designed by such architects as Jack Nicklaus, Arnold Palmer, and Mark McCumber. Water activities abound with swimming pools on site, but if it is the ocean you crave, you will not have to go far. Accessible by resort shuttle, the Beach House is approximately one mile away. With many of the necessary beach going items available from the resort, you can spend the day on the sand and in the surf. The amenities at Disney’s Hilton Head Island Resort are numerous. Bicycle rentals, shuffleboard, bean bag toss, foosball, basketball, horseshoes, a playground, pool table, and a game room offer a variety of options for every guest to enjoy. In addition, a 300’ fishing pier provides the opportunity to create that vacation “fish story.” There is even a naturalist that can share about some of the wildlife found in the area. Other water-related activities that are local adventures are dolphin tours, kayaking, and shark fishing. There are also a number of activities provided by resort staff that range from arts and crafts projects to scavenger hunts. These activities vary from day to day, but there always seems to be something new to try. At night, there are Movie nights, miniature golf games, Capture the Flag games, and other competitions among resort guests. Every vacation has to include good food. With over 250 restaurant options on the island, every member of your party will find something they love. Lest the shopper in your group feels left out, Hilton Head Island Resort is home to over 250 stores and outlets. And, as if this were not enough, if you must get out and explore the island further, there are a handful of museums, an art pavilion, an art gallery, and other points of interest. As with all Disney properties, each is unique in its setting, but all have that special Disney magic. Charming and cozy and graced with old-fashioned southern hospitality, Disney’s Hilton Head Island resort is no different. The golfer, the beach bum, the shopper, or the one who just came to relax will all find something they love at this beautiful island resort.